In this screen print series, I achieve moiré effects using a simple stripe pattern. The work is created by layering together multiple variations of the stripe pattern while slightly offsetting each layer from one another. Each stripe pattern variation is created through a photosensitive process where light is exposed to a screen coated with photo-emulsion. 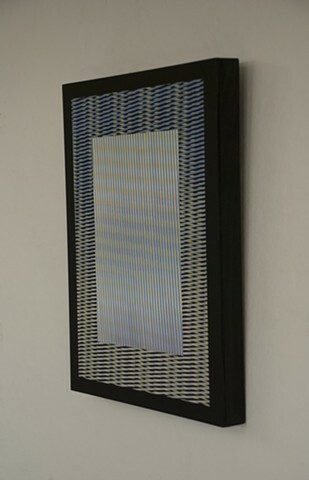 A striped stencil used to block light determines the resulting pattern on the screen. Variations in the pattern are the result of double exposing the stencil to the screen. Adjusting the placement of the striped stencil between the first and second exposure produces a unique intersection and interference pattern of the stripes. The initial stripe pattern along with the different resulting interference patterns are printed as layers in succession using varying color gradients to create transitional shifts and swells over the image. Differences in color hue, value, and intensity are juxtaposed intuitively to achieve other optical effects in combination with the moiré patterns. After printing, my process continues with hand cutting, rearranging, and collaging the printed elements to add further complexity and balance to complete each artwork.